Just to let you know our Doody was eight months old yesterday. He is quite a character, they all have their own personalities of course. 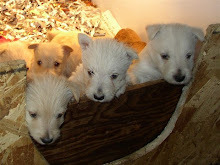 He joined our other two Cairn Terriers who are now four years of age. They have many hours of enjoyment playing together. We have a large fenced in backyard for our kids to enjoy, never hooked up. When Doody yawns in the morning, he makes a sound all his own !!! Will forward along some photos soon.